When thinking about sustainability, the three big R’s come to mind: reducing, reusing, and recycling. However, this makes it easy to overlook how we can be sustainable in other aspects of life. The U.S. Environmental Protection Agency says that residential and commercial building contributes up to 40% of landfill wastes, and 40% of global carbon dioxide emissions are linked to the construction industry. In 2015, the United Nations gathered in Paris to unite our efforts of combating global climate change. Together, it was decided to limit the temperature increase to 2°C in hopes of reducing irreversible effects on the environment. While the three R’s are a great first step to limiting harmful greenhouse gas emissions, we should make an effort to stop the problem at its source. One way to stay under the 2°C limit is to go biobased, especially in the construction industry as it’s a major source of carbon dioxide emissions. Researchers from the Massachusetts Institute of Technology (MIT) and the University of California-Riverside have developed a self-healing material which utilizes greenhouse gases in the atmosphere to regenerate itself, similar to a plant. The scientists have stated the gel-like material is “capable of growing like a tree.” The substance mimics photosynthesis by using carbon dioxide from the air as its “food” and produces carbohydrates and oxygen. With a global focus on being more sustainable from the products we create to the materials we use, it is not unlikely this material will be used for commercial buildings in the near future as maintenance costs would drastically decrease due to its self-repairing properties. 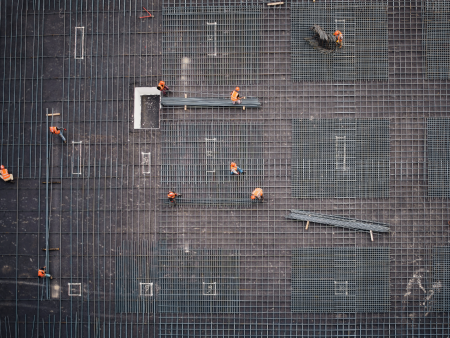 Many construction companies use concrete when building bridges, foundations, parking garages, and more. Two common drawbacks when using concrete include cracking and buckling. Cracked concrete causes enormous maintenance and building costs as it could lead to collapse if not taken care of. A Dutch researcher found a way to create bioconcrete, a concrete that heals itself using bacteria. The bacteria are activated once the concrete cracks and water seeps through. Once activated, calcite (limestone) is released to “fill in” the cracks. In Indiana, Purdue University researchers have created a 3D-printed cement paste biomimicking arthropod shells. The cement becomes stronger once pressure is added to it, similar to a lobster shell. Both of these techniques take concepts found in nature to reinforce concrete, and make a more durable product. Utilizing biobased construction materials can reduce energy, time, cost, labor, and more when building. Additionally, with the increase of natural disasters in the past decade, stronger buildings mean it is more likely the building will withstand disasters, allowing for shelter in times of crisis. As consumers are beginning to demand companies become more sustainable, it is not far-fetched they will soon turn to sustainable construction efforts as well. Stay up-to-date on your biobased knowledge by following us on Twitter: @OhioBioProducts. This article was written by Shivani Patel, OBIC Student Assistant and Senior at The Ohio State University.